Happy Friday! I am so excited for the weekend I've been dancing around the house and doing ninja moves around corners. Yeah I bet that's funny to picture, believe me it's more hilarious in real life. No major plans for the weekend, just excited to be one step closer to our trip! Starting the packing and cleaning tomorrow. I think I am grossly underestimating how much to pack for five people. Plus, I need to stock the fridge for our house-sitter. The to-do list is long my friends but there are white sandy beaches at the end so I really don't care at all. Right now I've got all the kids asleep (nothing short of a miracle) so I decided to take some time and post the LOTW. I know that I missed last week and I'm sure you were devastated.... But no worries! The one for this week is a fun one. 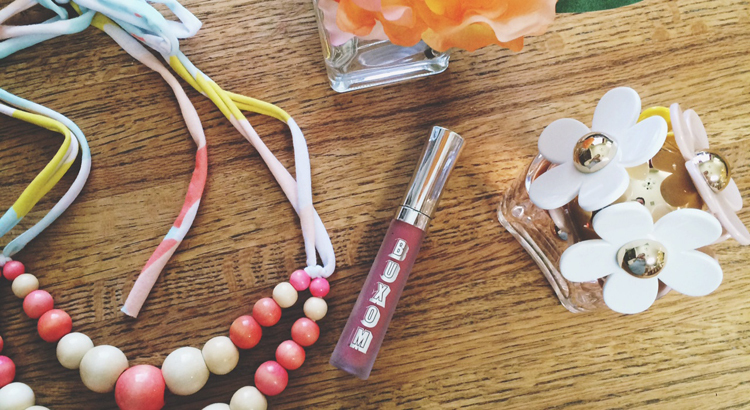 This is a lip cream by Buxom. It's creamy (duh) with no shimmer or sparkle, which is great because I'm not a huge fan of either of those things. It smells delicious (like cupcakes) and has this tingling effect which is this natural plumping agent apparently. It has no GMO's or paragons which is the bombdotcom. I'm wearing the color "Mudslide". So while I like this one, I don't like it enough to get it in another color. If that tells you anything. When I really like a lipstick I'll have it in at least a couple shades. I know. I have a problem. If a little bit of color and shine is your thing then you'll want to check this one out! Have a wonderful weekend friends! Make sure you do a little dancing and some ninja moves to celebrate.